My favourite Final Fantasy game is VII. But it’d been over a decade since I last played FFVII and I wondered how it would hold up. I downloaded the PS4 version and played through the entire game again. This time, Square gave players endless limit breaks, the option to avoid random battles, and the ability to speed up the game to three times its normal speed. This let me focus on what I loved most about FFVII, which was the narrative, character development, and quirky side stories. I was glad to find that I still enjoyed the story. There were so many memorable moments, from breaking into Shinra Headquarters and finding that trail of blood, to wandering a train graveyard to try and prevent the destruction of Section 7 (that NPC at the train station is one of my favourites), and even chocobo racing at the Gold Saucer. I loved revisiting familiar sites and listening to that melancholy, grand overworld theme (Nobuo Uetmatsu’s FFVII score is disturbingly eerie, playfully whimsical, and movingly sad). 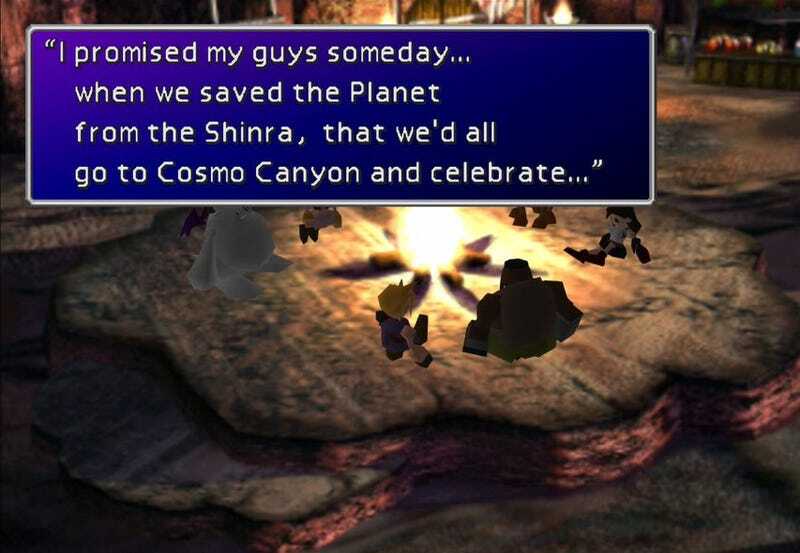 The scene that struck me the most though, apart from Cloud’s dive into his convoluted maelstrom of memories, was the first time your party visits Cosmo Canyon. There are actually some similarities in structure with the Chrono Trigger campfire scene which I wrote about last year. Both moments highlight the themes that tie the story together, giving deeper significance to Sephiroth’s mad quest as well as Cloud and company’s struggle to stop him. The Cosmo Canyon represents a brief reprieve from the main quest. While Sephiroth and Jenova still await, Cloud’s buggy has broken down. Fortunately, they’re near the home of Red XIII, also known as Nanaki. Cosmo Canyon stands as stark contrast to the technologically superior, but physically decaying, metropolis of Midgar with its slums and corrupt decadence. The city of Cosmo Canyon is built into the canyon itself, symbolising its unity with nature. There’s an observatory at its peak intended as a way of studying the planet and the universe itself. It’s become a sort of Mecca for those wanting to learn more about the planet. The Cosmo Candle burns eternally at its base, emblematic of life itself. Red XIII has come to the end of his journey. He’ll be leaving the party so he can stay and protect Cosmo Canyon. That’s when Red XIII introduces the party to his grandfather, Bugenhagen. 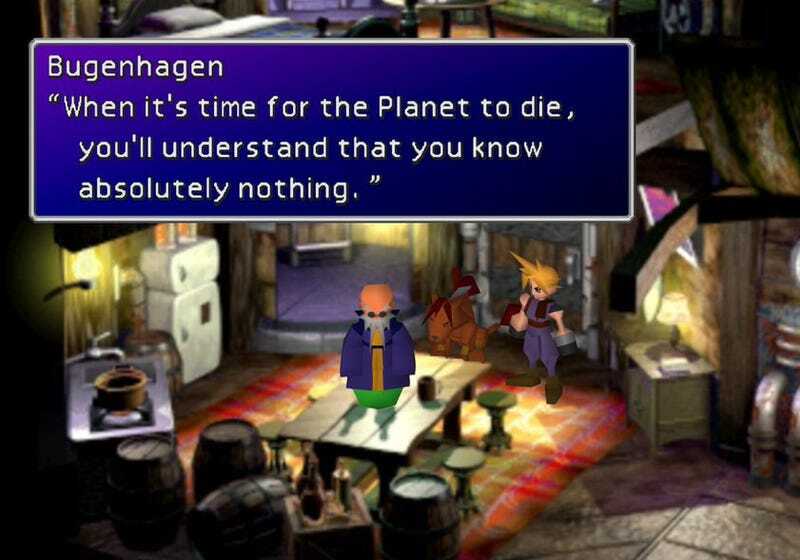 Bugenhagen is the sage of FFVII, but he’s different from the trope of the old wise man in that he’s a fatalist. He is convinced the world is going to end and there’s nothing anyone can do to change it. This is when we first hear the planet crying, suffering from the pain that’s being inflicted by humans. The idea of the planet actually being alive was startling for me back then. 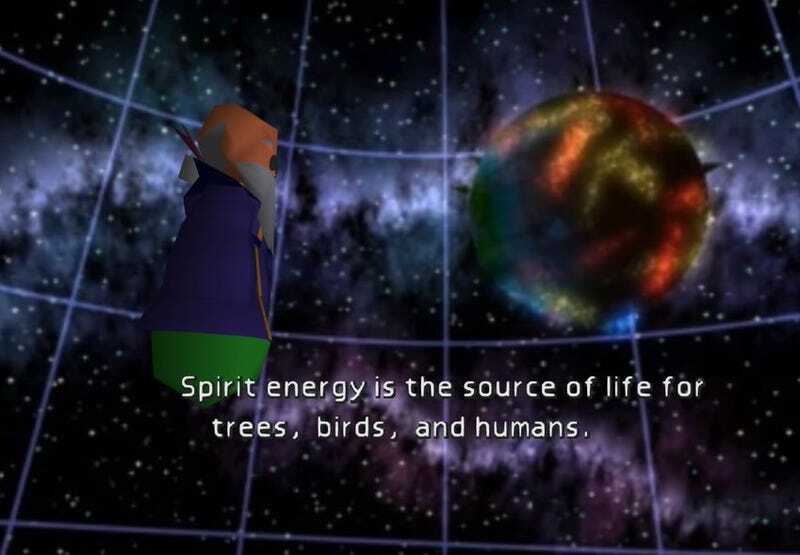 Through the use of a nifty holographic projector, Bugenhagen gives Cloud and company a talk about the stream of life, the connections and cycles inherent within the planet, and the imbalance that is threatening to ruin everything. Experience has convinced him the exploitation of the Lifestream through the Mako reactors will result in the planet’s death. Shinra is exploiting the stream to further its own agenda and most people seem indifferent to the destruction it’s causing as long as they’re enjoying the comforts of Mako energy. The idea that the environment isn’t just a separate entity divorced from humanity is an important idea, as is the one that human action has an impact on the planet. “Spirit energy makes all things possible, trees, birds, and humans.” Drain that spirit energy, and it results in catastrophe. I found these environmental themes especially poignant knowing Hironobu Sakaguchi explored the ideas of the Lifestream following the death of his mother. 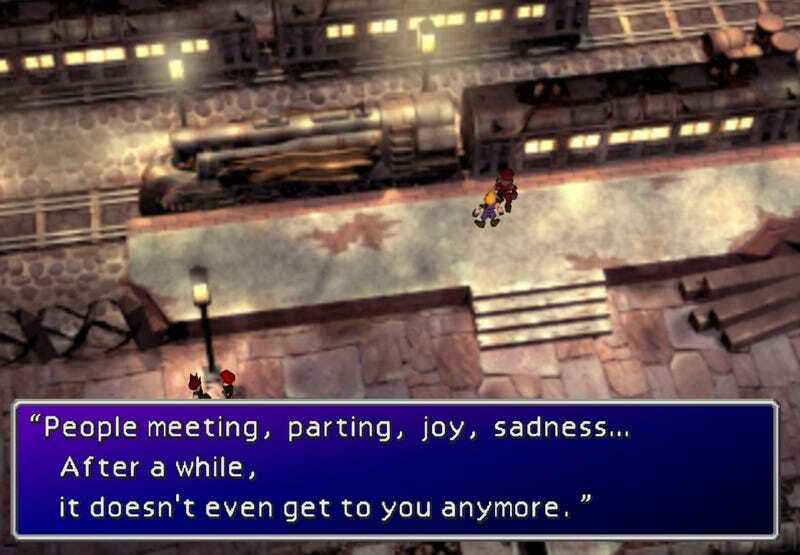 He channelled much of his sorrow into these concepts and while others would take over development of FFVII, that sense of tragedy and yearning pervades throughout the entire game. Every one of the party member’s deals with death in their own personal way, all the more punctuated by what happens to Aeris later. The idea of a lifestream that’s always flowing, always in flux while absorbing energy from living beings and then recycling it anew, is a beautiful and comforting metaphor for existence. After the observatory, the team gathers together in a campfire scene and everyone shares a little about what they’re feeling. Barrett expresses his guilt at the death of the other Avalanche members and recalls how he’d wanted to visit Cosmo Canyon as this was the birthplace for the organisation. Context is important here. The sequence before Cosmo Canyon had Barrett facing off against Dyne, his old friend. Coming so shortly after that deadly confrontation, I could feel the mixed regret, sorrow, and pain that he was struggling with. He finds himself rejuvenated and pronounces Avalanche born anew. Tifa tries to explain her doubt about Cloud’s condition, questioning his memories but not going so far as to say what’s really on her mind. “I’m afraid to ask,” she confesses. In a game where memories can’t be trusted and the past is as twisted as the tiers and layers within Midgar, even these whispers carry deeper meaning as Tifa doesn’t fully grasp their place in all of this. Staying in character, Yuffie is bored by the lack of materia while Cait Sith is reserved, trying to recollect how long it’d been since he’d last visited Cosmo Canyon. Aeris is wracked by her growing sense of isolation and loneliness as she’s becoming aware of her role as one of the Ancients. “I’m...alone… I’m all alone now…” she says. 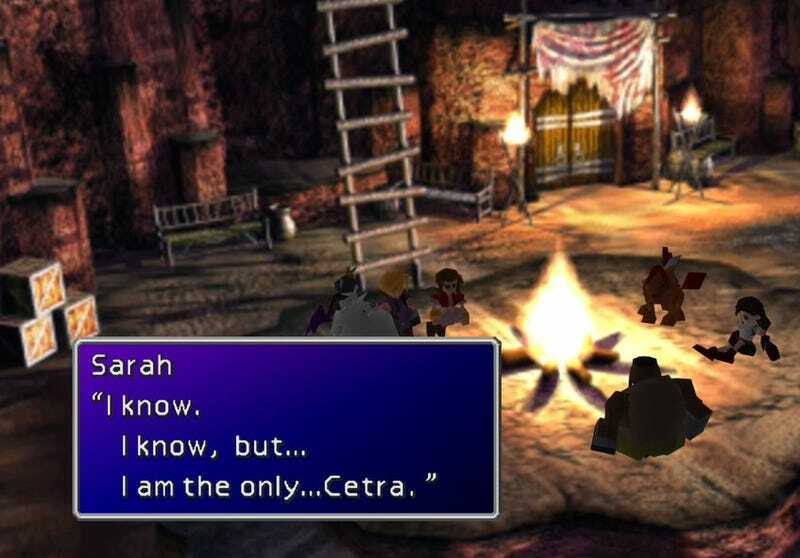 When Cloud tries to reassure her and tell her they’re all there for her, she shakes her head and acknowledges, “But I am the only Cetra.” Again, this dialogue wouldn’t be as significant if I didn’t know what awaited her. Aware of her fate, it feels like ominous foreshadowing. I love team moments like this in games where you get a sense of everyone’s frame of mind. It makes you, as the player, feel a closer bond to them. At the same time, it also serves to hint at some of the deeper struggles each character is wrestling with and show how the journey isn’t just a physical one, but a spiritual one where each is finding something new about themselves. In more basic terms, each of them also represents a different type of player, whether those who just want the gameplay and are bored by the story (Yuffie), those confused by what in the world going on (Tifa), or those who find Cosmo Canyon a meaningful and rejuvenating story element (Barrett and me). Red XIII, on the other hand, is still angry about his father. Many years ago, during a battle to protect the Cosmo Canyon against the Gi Tribe, his father fled in fear, leaving his mother to die. 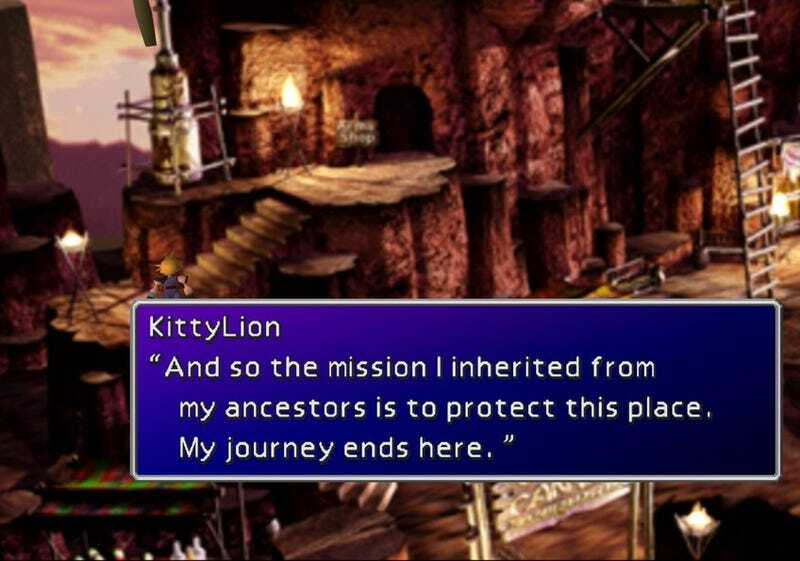 Red XIII is ashamed of his father’s actions, which is when Bugenhagen questions if he knows what really happened. Red XIII is guided by Bugenhagen into a sealed cavern through the Gate of Naught. 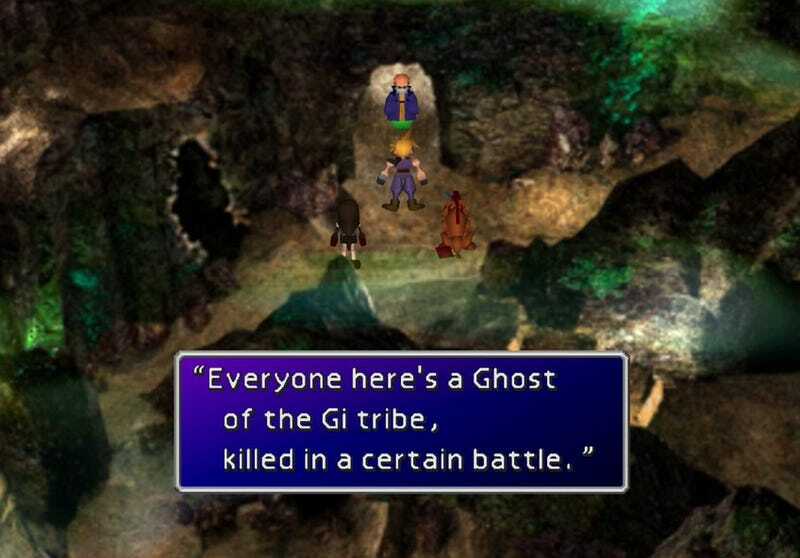 Every enemy you confront is a ghost of the Gi tribe, killed in battle, restlessly driven by anger and rage. Each fight is wrestling with the legacy of that past as countless people have died here. This is the reverse of the life and hope represented above, this graveyard full of ghoulish spirits. Red XIII is in essence reliving his parent’s past battle, only with Cloud and company by his side. When Red XIII declares his own name and Seto’s tears begin to fall, I’ll admit, even though I was familiar with the scene, I had a hard time holding back tears. The music track, “The Great Warrior,” is bittersweet and all so compelling. Not only had Red XIII come to terms with his own past, but Bugenhagen had also found a glimmer of hope, pushing him into action. Your party, witness to the arc, is renewed in their determination. Life and death are deeply intertwined, and it’s only by individual action, fighting against all odds as Seto did, that change can be wrought. I’m glad all these years later, these themes still resonate and makes sure this fantasy’s message are anything but final.